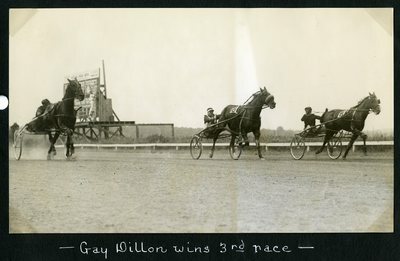 Black and white photograph of bay mare, pacer Gay Dillon wearing saddle number six (far right) winning the first heat of the 2.08 Class Pace in a time of 2.05, A. Cameron up. Black gelding, Star Gale (far left), F. Church up finished the contest in second place. Brown gelding Sunrise (middle), wearing saddle number crossed the line in third place, W. Clearly up.